Once a week I run a one-hour art class for under 5s. It’s attended by a group from a local nursery, and there is no nicer sound than hearing the children laughing with excitement as they come along the corridor towards my room. It’s great fun to spend time with three-year-olds – they are such charming, funny and entertaining people. It’s lovely to dip into a world where the only problem is whether to play ‘Wheels on the Bus’ or ‘Bananas in Pyjamas’ at the end – this choice seems to be loaded with a great deal of emotional significance and has been known to cause tears. 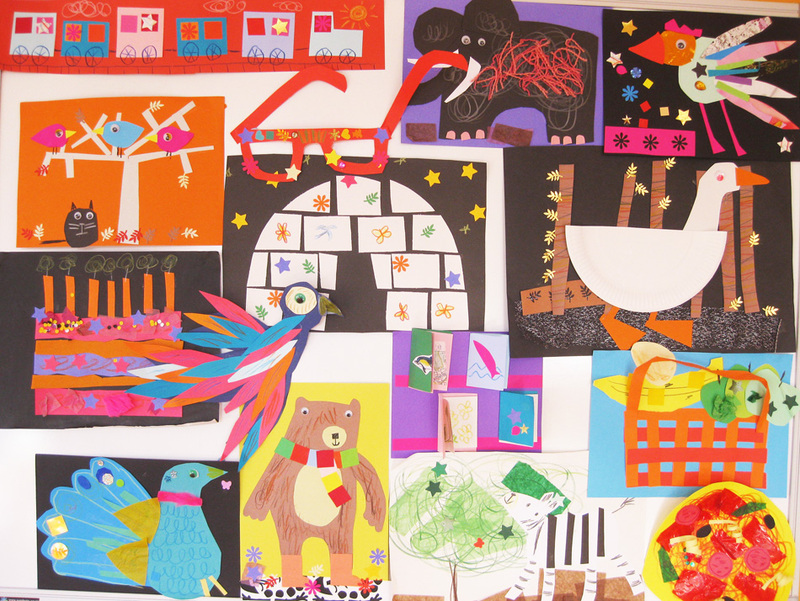 I’ve filled a noticeboard in the room with past projects – they are usually collage-based and inspired by a different picture book each week, which I then read to the class. Can you spot work inspired by Petr Horacek, Jenni Desmond, Karin Littlewood, Leigh Hodginson, Ed Vere, Yasmeen Ismael, Neal Layton and Chris Haughton? I make a lot of use of novelty hole punches from Blade Rubber, a shop just near the British Museum – they have a tremendous range to choose from, with leaves, stars and flowers being especially useful. This entry was posted in collage, Workshops on January 29, 2015 by Jane Porter.